CAIRO The judge in the trial of Egypt's deposed Islamist president and 14 others adjourned the hearing on Monday as the defendants refused to recognize his legitimacy and repeatedly disrupted the proceedings. The judge said the trial would resume on January 8. Security officials inside the courtroom said the initial delay was caused by Mohammed Morsi's insistence not to change into the prison uniform customarily worn by defendants -- part of his refusal to recognize the trial's legitimacy. Morsi and the others are charged with inciting murder and violence and could face the death penalty if convicted. Egyptian security officials said Morsi told the court that he remains the "legitimate president" of the country, and he rejected the proceedings against him. The defiant remarks came shortly after the trial began in Cairo. CBS News correspondent Clarissa Ward said the brief proceedings on Monday were a "total circus," with journalists and lawyers arguing back and forth and Morsi shouting out loud, "I am president of the Republic!" The officials said Morsi's comments came in response to a judge calling his name out after identifying him as a "defendant." Morsi replied: "I am Dr. Mohammed Morsi, the president of the republic. I am Egypt's legitimate president." He added: "I refuse to be tried by this court." Egypt's deposed Islamist president was brought from the secret location of his four-month detention for trial Monday on charges of incitement of violence and murder. 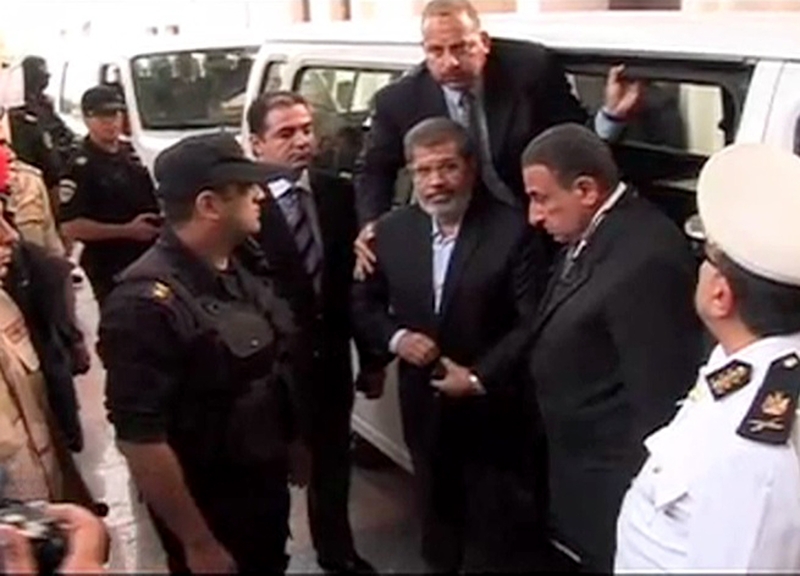 It was Morsi's first public appearance since his ouster in a coup on July 3. Since his ouster, Morsi has been held at a secret military location. He was flown Monday to the venue of his trial -- a police academy in an eastern Cairo district -- by helicopter, according to Egypt's official MENA news agency. His co-defendants, 14 senior members of his Muslim Brotherhood, were taken to the venue from their jail in a suburb south of the city in armored police cars. The trial is fraught with risks and comes amid a highly charged atmosphere in a bitterly polarized nation, with a deepening schism between Morsi's Islamist supporters in one hand and Egypt's security establishment and the nation's moderate Muslims, secularists, Christians and women on the other. In a last-minute change, authorities on Sunday switched the trial's venue in a move apparently aimed at thwarting mass rallies planned by the Muslim Brotherhood, the group from which Morsi hails. Security was tight around the trial's venue, with hundreds of black-clad riot police backed by armored vehicles deployed around the sprawling complex. Several military armored vehicles were also deployed. Police helicopters hovered over the site. The final stretch of road leading to the academy was sealed off, with only authorized personnel and accredited journalists allowed to approach the facility. The academy is also being used for the re-trial of Morsi's predecessor, Hosni Mubarak, whose 29-year regime was toppled in a 2011 popular uprising. Mubarak is charged with failing to stop the killing of some 900 protesters during the 18-day uprising. Several hundred Morsi supporters gathered outside the police academy, carrying posters of the ousted president and banners depicting an open palm with four fingers - the symbol commemorating a pro-Morsi sit-in that was violently cleared by security forces in August. They also chanted slogans against Gen. Abdel-Fattah el-Sissi, the military chief who led the July coup. Across town, several hundred Morsi supporters also rallied outside the Supreme Constitutional Court and the capital's main court complex in the downtown area. "I came here to witness this farce," Gamal Azab, a Morsi supporter, said outside the police academy. "I am not afraid of the police, but I am worried about my country." Since his detention, Morsi has had little communication with the outside world. He will likely represent himself in the trial, the first public figure to do so in the host of trials of politicians since Mubarak's ouster, Brotherhood lawyers have said. Morsi will also likely use the platform to insist he is still the legitimate president of Egypt, question the trial's legitimacy and turn it into an indictment of the July coup, further energizing his supporters in the street. During four months of detention, Morsi has been extensively questioned by prosecutors and has not been allowed to meet with lawyers. He has spoken at least twice by telephone to his family and received two foreign delegations. Brotherhood supporters have called the detention an outright kidnapping, and Morsi has refused to cooperate with his interrogators. Morsi will face charges along with 14 other Brotherhood figures and allies - including top leaders Mohammed el-Beltagy and Essam el-Erian - in connection to clashes last December outside his presidential palace that left at least 10 dead. In those riots, Morsi supporters set upon peaceful protesters camped outside the Cairo palace. Day-long clashes followed and video clips posted on social networks showed Morsi supporters detaining and torturing opposition protesters outside the walls of the palace. The Brotherhood claims that most of the victims were Brotherhood supporters, but that assertion is disputed. Unlike Mubarak's first trial, the proceedings against Morsi are not likely to be aired live. After Monday's session, Morsi will probably be taken back to the secret location he has been held at, instead of being transferred to a normal prison, for fear his supporters would turn the prison surroundings into a "focal point of endless protests." The judge in Mubarak's retrial has ruled that those hearings would not be televised, a move seen as a reaction to the chaos that defined the first trial, when Mubarak and his security chief received life sentences. After the July coup, Egypt has witnessed one of its worst bouts of violence in decades. On Aug. 14, security forces violently cleared protest camps set up by Morsi supporters, sparking days of unrest that left more than 1,000 dead. Since then, violent incidents have multiplied: a suicide car bomber tried to assassinate Interior Minister Mohammed Ibrahim in September, and dozens of members of the security forces have been killed in a string of drive-by shootings, explosions and car bombs. Churches have been torched, and in an attack in Cairo last month, four Christian Copts and one Muslim were killed in a drive-by shooting outside a church. Both government officials and Morsi's supporters forecast bleak scenarios for Monday, with each side accusing the other of plotting killings, including that of Morsi himself. There were no reports of violence by late morning. A Brotherhood-led group has called for mass rallies, while the interior minister has ordered the deployment of large numbers of security forces to guard the trial venue. Ibrahim, the interior minister, has warned that any breach of security by Morsi supporters would be harshly dealt with. Cairo's traffic was lighter than usual for a Monday morning, suggesting that some of the capital's estimated 18 million residents have opted to stay home for fear of violence. Some private schools told parents to keep their children at home Monday, but state schools, government offices and banks were operating normally. Security was beefed up at vital installations across the country in anticipation of violence. Meanwhile, a newspaper known for close ties to the military published on Sunday what appeared to be the first pictures of Morsi in detention. The daily el-Watan published a transcript of remarks it says were made by Morsi and captured on video, describing him as being "in total denial" and saying, "I am the president of the republic, in accordance with the constitution." Later in the day, it posted a video showing Morsi wearing a blue track suit, sitting on a chair and speaking calmly. Treading a fine line on the trial after the White House declined to classify Morsi's ouster as a coup, Secretary of State John Kerry has said only that the U.S. doesn't believe in politically motivated persecutions. While Kerry has insisted the temporary halt to some U.S. financial aid to Egypt was not punishment, CBS News foreign affairs analyst Pamela Falk says that's exactly how the Egyptians see it. With the dual trials playing out and Egypt's political future and security so uncertain, Falk says the country stands at a crossroads in its relations not just with U.S., but with Israel and other regional powers. International rights groups have called for a fair trial for Morsi. In a Sunday statement, London-based Amnesty International said Morsi's trial is a "test" for the Egyptian authorities, who must grant him the "right to challenge the evidence against him in court," said Hassiba Hadj Sahraoui, Amnesty's Middle East director. Morsi's family considers the trial illegitimate and will not attend, his son Osama told The Associated Press on Sunday. He said they feared they would be mistreated and humiliated.